Paulo Bruscky: Art Is Our Last Hope is the first survey exhibition of Brazilian artist Paulo Bruscky’s career in the United States. The catalogue accompanying the exhibition offers English-speaking audiences a window onto Bruscky’s pioneering production for the first time. The volume features two major essays interpreting the various facets of Bruscky’s work. Dr. Bessa contextualizes Bruscky’s practice within the broader international scene by tracing a parallel between the artist’s strategies and the various theoretical and philosophical ideas current since the late 1960s. Dr. Davidson, who defended a doctoral dissertation on Bruscky’s work, contributes an essay exploring what he called “communication art” in all its iterations: mail art, telegram art, fax art, xerox art, and newspaper classifieds, all linked by the artist’s subversion and simultaneous transformation of ready-made communication systems into unorthodox channels for art. 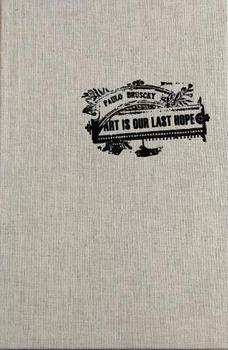 The book also includes an interview with Paulo Bruscky conducted at the artist’s studio in April, 2013, by Dr. Bessa, and a chronology spanning the artist’s career, including an overview of the socio-historical context in Brazil throughout the 1960s and 70s, organized by Dr. Davidson.